Home Content Database SharePoint SharePoint 2007 SharePoint 2010 SharePoint 2013 SharePoint 2016 SQL Server How to Move SharePoint Content Databases to Another Drive? How to Move SharePoint Content Databases to Another Drive? 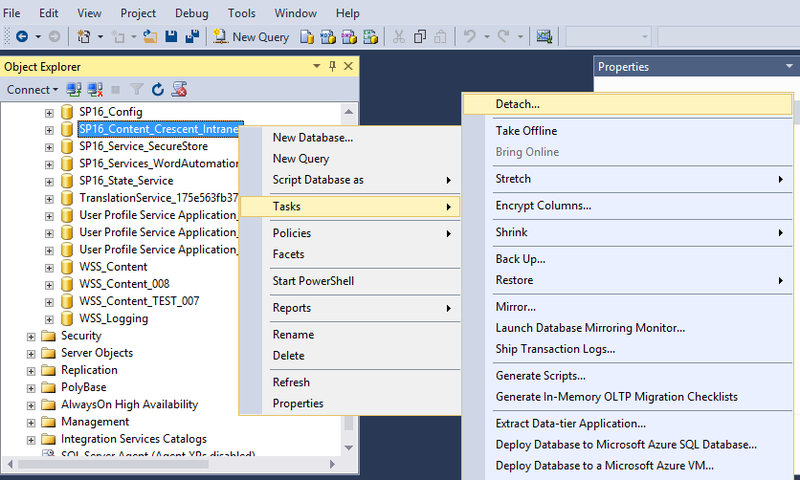 Move SharePoint content database from one drive to another in SQL Server! By default, SharePoint creates its databases in the default SQL Server location: "C:\Program Files\Microsoft SQL Server\MSSQL13.MSSQLSERVER\MSSQL\DATA" folder (SQL Server 2016). We don't have any option from SharePoint side to specify where the data and log files for the database to be created. Important: As always, Backup your databases before performing any of this activity! Mount the database back to SharePoint: Mount-SPContentDatabase -Name "Content-database-name" -DatabaseServer "db-server-name" -WebApplication "Name-or-URL-of-the-webapp"
Lets move SharePoint SQL Server Database Files to different drive location. First, make a note of all database files associated with the database such as MDF, NDF & LDF. Make sure you stopped SharePoint from accessing the database. If you don't stop SharePoint services or dismount the database from SharePoint side, You'll get "Cannot detach the database 'Content-Database-Name' because it is currently in use." Error! Check "Drop Connections" >> Click OK to detach the database. Once you detached the databases, You can move your database files to a new location (just a Cut-Paste from Windows Explorer) wherever required. Its a best practice to place DATA and LOG files to a different location. Once the database files are moved to a new location, Lets attach it to SQL Server again. Click on Add >> Browse to the new location for the databases and select the MDF file. All associated NDF and LOG files will be attached automatically. 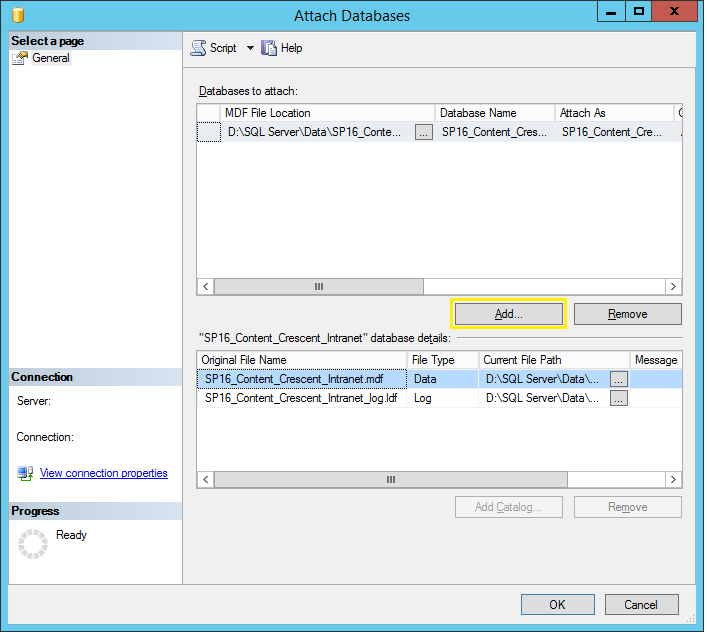 Click OK to attach the database to SQL Server. Use the article to start all SharePoint services again: How to Start all SharePoint 2013 Services. That's all! We moved SharePoint database from one drive to another!! Browse to your SharePoint site and verify all works correctly! 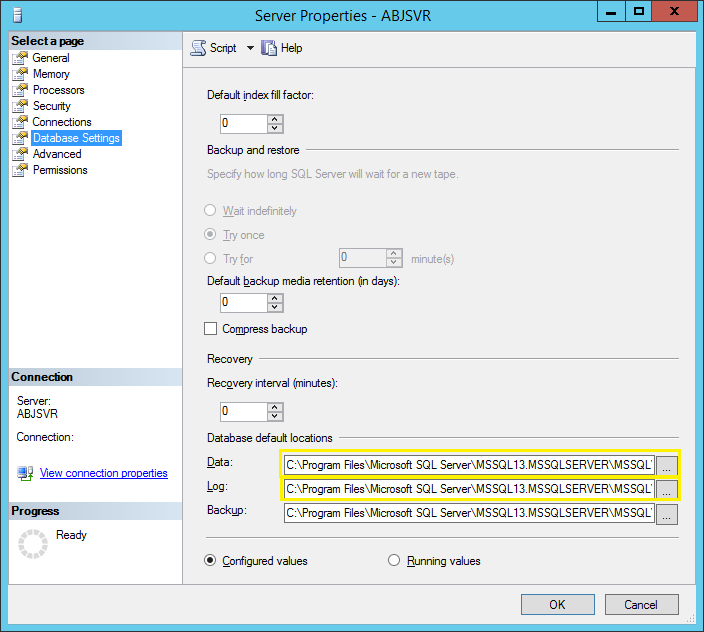 How to Change the default location for SQL Server Databases? Well by following above steps we can move existing SharePoint database to different drive. How about new databases we are going to create in future? Under "Database Settings" tab, Specify the locations for Data, LOG and Backup. Hit save to commit your changes. Restart your SQL Server Service for the changes to take effect.